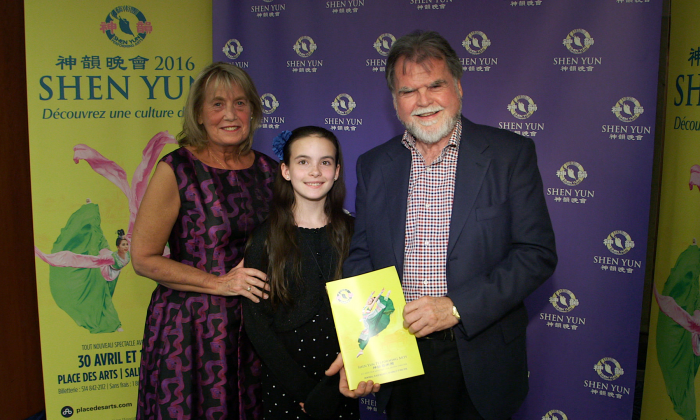 MONTREAL, Canada—Denis St-Amour saw Shen Yun Performing Arts at Place des Arts on April 30 and not only enjoyed its aesthetic beauty but also found that the spiritual meaning conveyed by the renowned classical Chinese dance and music production resonated with him. HPIC is a relief and development agency that helps people in the developing world by delivering medicine, improving health conditions, supporting capacity building, and providing emergency relief. Mr. St-Amour further explained what really impressed him about the classical Chinese dance and music performance, which includes dance-stories inspired by ancient myths and legends as well as contemporary events. The show does not shy away from stories of peaceful resistance to repression in modern-day China, such as that of the persecution of Falun Dafa by the Chinese regime. “You see such excellence in the way they express the story, out of dance and out of emotion and out of feeling, so it’s very impressive,” he said. New York-based Shen Yun was founded in 2006 by practitioners of the traditional Chinese mediation discipline Falun Dafa, according to the company’s website. The practice is based on the principles of truthfulness, compassion, and tolerance and is rooted in China’s ancient spiritual traditions, but it has been persecuted by the Chinese regime since 1999. The company’s mission is to use the performing arts to revive the essence of Chinese culture, whose central ideals, such as benevolence and justice, respect for the heavens, and divine retribution, originate from Confucianism, Buddhism, and Taoism. But since the ruling communist regime in China is officially atheist, Shen Yun in fact cannot be seen in China today, despite the warm welcome it receives everywhere else when it tours the globe each year with an all-new program. Mr. St-Amour echoed the appreciation expressed by many other audience members. “There is a lot of drama in there, there’s happiness, there’s sadness, you see individuality and you see kind of a collective feeling, so I find it very all-encompassing,” Mr. St-Amour said. He was at the production with his wife, Nancy Rokas, and his granddaughter, Samantha Rivard. Her grandfather explained that she was very impressed by the synchronicity of the dancers. “She loves the way everybody does everything exactly at the same time—the choreography,” he said. Ms. Rokas praised the performers for their diligence and effort put into the performance. “It was amazing … the hard work that was put into it and the amount of discipline that they had to go through to get to that point,” she said. Mr. St-Amour said it is a performance that will speak to and benefit everyone, noting the importance of respecting people’s right to freedom of belief. “I think the performances are enlightening. They tell a story that people need to hear and I think that the more people that hear it the better it is,” he said. Prior to becoming president of the HPIC, Mr. St-Amour was an entrepreneur and management consultant who had also served in many other leadership roles, including as the global chair of the board of World Vision International, one of the largest relief and development organizations in the world. New York-based Shen Yun Performing Arts has four touring companies that perform simultaneously around the world. Shen Yun’s International Company is currently touring Eastern Canada. For more information, visit Shen Yun Performing Arts.